The Little Flower St Vincent de Paul (SVDP) Conference – The entire College community responds to the needs of the SVDP Conference at all times during the year, but particularly at Christmas when Home Rooms support local families in need with Christmas food hampers and gifts. Staff, parents and students are involved regularly with our local Little Flower SVDP Conference in delivering bread to needy families in the Kedron and Stafford area on a Sunday or Thursday afternoon. Delamore Retirement Community – We offer hospitality and companionship once a week by serving afternoon tea outside school hours. This ministry is open to all year levels. Sony Children’s Holiday Camp – A small group of Year 12 students joins students of Marist College, Ashgrove to act as companions to children with disabilities on the Sony Children’s Holiday camp during the first four days of the September holidays. 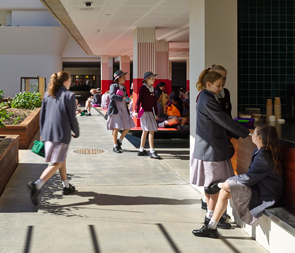 Z Club – A club for all members of the Mount Alvernia community is the Z Club, a branch of Zonta International, which is a service and advocacy organisation promoting social justice for women and girls. Z Club organises events and projects to raise funds and awareness for disadvantaged women, both locally and internationally, such as the annual assembly of birthing kits for women in developing countries. The Mount Alvernia Z Club is sponsored by the Zonta Club of Pine Rivers, which assists in funding for projects, mentoring, and community collaborations.